85 days. Capsicum annuum. (F1) Plant produces good yields of beautiful rich chocolate brown sweet bell pepper. Excellent for salads, stuffing, or cooking. A must for the gourmet dishes. 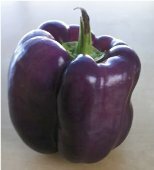 Try growing the Purple Beauty and Red Beauty to complete your gourmet pepper collection. Disease Resistant: TMV. Sweet peppers can be grown anywhere as long as you have 4 months without frost. You can also grow sweet peppers in containers. 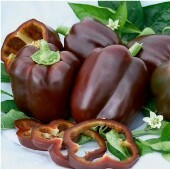 Sweet Pepper seeds are sensitive to temperature and moisture. Do not soak the seeds in any type of solution or water before planting, as this may damage the seeds and they may rot and may not germinate. Plant your seeds indoors between January and March, or 5 to 7 weeks before setting outside in garden. Use Miracle Gro Seed Starting Material for best germination results. When plant is 12" or taller, transplant them outdoors. Only plant peppers outdoors on a cloudy day, just prior to getting rain. Plant when soil is warm, at least 2 weeks after last frost, and when temperatures remain above 70 F. Please read the Tips on Growing Hot Peppers as Sweet peppers and hot peppers are grown in relatively the same manner. Plants can grow 3 to 4 ft tall. 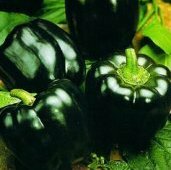 Harvest sweet peppers when they are green or fully mature using a garden scissor so you don't damage the plant. Pick peppers as they mature to encourage new buds to form.